Sri Lanka is the essence of a people renowned for their hospitality, stunning landscapes, rich biodiversity and a wealth of incredible, immersive experiences on offer for travellers. Within a mere area of 65,610sq.km lie eight UNESCO World Heritage Sites, 1,330km of coastline - much of its pristine beach, 15 national parks showcasing an abundance of wildlife, nearly 202,343ha of lush tea plantations, 101,171 of botanical gardens, 350 waterfalls, 25,000 water bodies, and a culture that extends back over 2,500 years, with well-preserved archaeological monuments, mostly from the country’s Buddhist heritage, one of the world’s most scenic rail routes. Therefore, it comes as no surprise that the year 2019 is marked with many remarkable milestones for Sri Lanka’s tourism industry, with Lonely Planet naming Sri Lanka as the top country for travel and recognising Colombo City, the commercial capital of Sri Lanka as the “must-photograph” travel destination; Travel Week Magazine of Canada naming Sri Lanka as a top destination for Canadian millennial travellers; BBC’s Good Food 15 Food Trends identifying Sri Lankan cuisine as No 1 Emerging Food Trend; and the only destination to win both Judges’ and Readers’ Awards for its respective continent of Travel Lemming Readers’ Award in Asia. “Already notable to intrepid travellers from its mixed religions and cultures, its timeless temples, its rich and accessible wildlife, its growing surf scene and its people who defy all odds by their welcome and friendliness after decades of civil conflict, this is a country revived,” mentioned Lonely Planet author Ethan Gelber in the Best in Travel 2019 publication. Sri Lanka, in addition to it multi-ethnic multi-cultural diversity, natural landscape, wildlife, pristine beaches and lush tea plantations, has another special attraction for Vietnamese as it was the country in which Buddhism was nurtured continuously for over 2,000 years, recording the philosophy for the first time in the first century BC, with thousands of ancient Buddhist monuments and world-renowned academic institutions to study Buddhism. Meanwhile, Sri Lanka Tourism launched its new brand identity “So Sri Lanka” in November. At the end of 2018, the total number of tourist arrivals from Việt Nam to Sri Lanka was recorded at only 3,189, but within past five years, the number has increased by 124 per cent. The Embassy of Sri Lanka is continuing its efforts to promote tourism in Việt Nam with many new initiatives. In this regard, since assuming duties from Ambassador Hasanthi Urugodawatte Dissanayake from August 2015 to the end of 2018, the Embassy has organised, participated and supported 233 events to make Sri Lanka better known in Việt Nam with 358 instances of coverage in the Vietnamese media. The most impressive events organised by the embassy in 2018 included Sri Lanka in Hà Nội: A Cultural Fiesta (April), Sri Lanka – Việt Nam Friendship Concert (June), Sri Lanka Handloom and Batik Fashion Shows with prominent Sri Lankan fashion designers, Dhammique Amarasekare and Sonali Dharmawardane (May and October), and “My Beautiful Sri Lanka” Painting Exhibition with prominent Sri Lankan artist Vasantha Perera (December). These events, no doubt, contributed much for Vietnamese to become more familiar with Sri Lankan culture, landscape and day-to-day life. 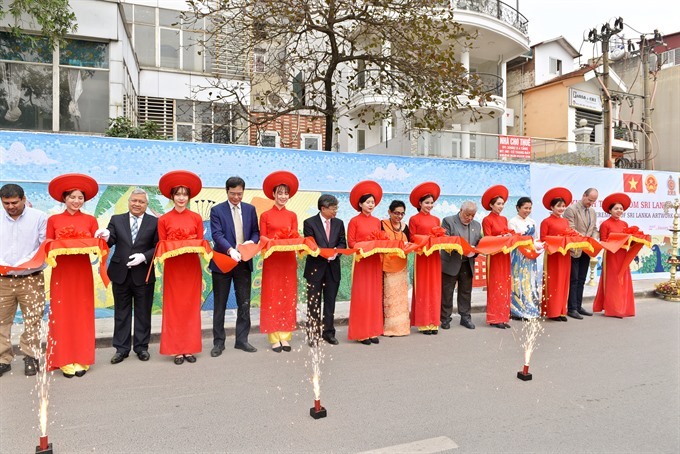 Meanwhile, marking a milestone of cultural diplomacy, on January 22, Vietnamese people were gifted with a Sri Lankan artwork created on Hà Nội Ceramic Road (Nghi Tàm Street). Another fundraising concert to support the Hope Choir, consisting of blind and partially blind youth, was organised in December 2018 as part of public diplomacy activities run by the embassy. In addition, the embassy participated in annual charity bazaars organised by the Hà Nội International Women’s Club and the Ministry of Foreign Affairs. Being conscious of the host country’s wellbeing, we also signed the “Code of Conduct on Plastic Pollution Prevention” to mark World Environment Day on June 4 last year, initiated by the Embassy of Canada, together with the Ministry of Natural Resources and Environment of Việt Nam and the Hà Nội People’s Committee. In bilateral relations, it was significant that Prime Minister Ranil Wickremesinghe visited Hà Nội twice in 2018, firstly to participate in the third edition of the Indian Ocean Conference: Building Regional Architectures in August, and the World Economic Forum on ASEAN in September. During the two visits, he held discussions with Prime Minister Nguyễn Xuân Phúc and Deputy Prime Minister and Foreign Minister Phạm Bình Minh. The focus was to take necessary steps to optimise trade potential and establish direct air connectivity at the earliest to facilitate tourism both ways. Speaker of the Parliament of Sri Lanka Karu Jayasuriya visited Hà Nội in April 2018 which paved the way for the donation of sacred relics of Buddha to Việt Nam as well as a sapling of the sacred Bodhi Tree, creating yet another cornerstone in Sri Lanka – Việt Nam Buddhist relations. Since establishing diplomatic relations in July 1970, 32 bilateral agreements and MoUs have been signed between the two countries, covering a wide range of subjects. Sri Lanka is now looking forward to an early high-level visit from the Vietnamese side and commencement of direct air connectivity.